This article describes how you can build custom thumbnail templates for search results, galleries, lightboxes and so on. 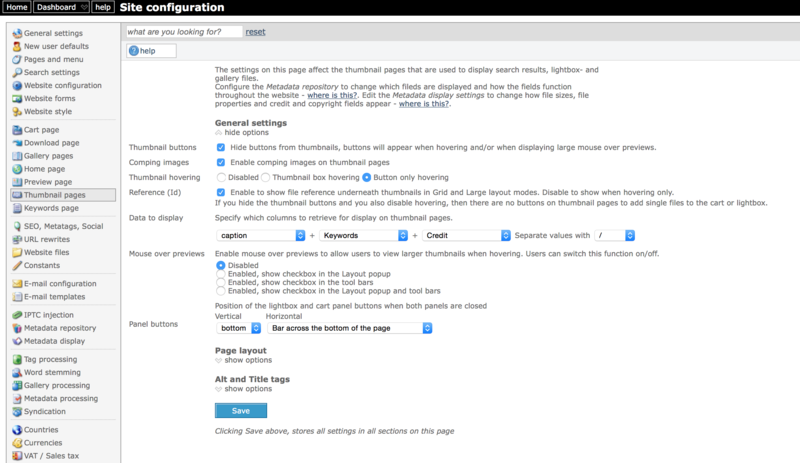 There are five different viewing styles that you can configure via Site configuration, Thumbnail pages. The modal lightbox page uses a grid type thumbnail. The code editor provides code examples for each of the styles (grid, list, small, large and flow), and for the modal lightbox thumbnails – that you can use as a starting point. If you load the first example code for one of the thumbnail templates and save it without making changes, then the client facing result is the standard result (i.e. what you get without customized thumbnail templates). There is also example code that you can use if you have configured your pages to use Google Icons instead of button images. Note that you can change just one or a few viewing style templates. You don’t have to make a custom template for every viewing style if for instance you just want to change the large thumbnail template. Recommended reading: Thumbnail hover text macro, Using the code editor, Infradox XS customisation. Make sure that you understand how the XS tags work, before changing the templates described here. You can find more information in the article Infradox XS functions, tags and conditions. You also need to know about constants, locales and repository properties before you start working on the thumbnail templates. It is recommended that you start configuring the thumbnail pages before you use the code editor to make template changes – because the settings will also affect your custom templates. Note that the default templates are complex and use several classes so that everything can be configured with back office settings without making code changes. If however you are going to make code changes, then the code can be simplified (and as a result smaller and faster) by removing classes and/or HTML you don’t need for your specific requirements. Configure the settings for hovering and so on as needed. Note that the options that are best used depend entirely on what you want to achieve with your custom templates. Create a support ticket if you need advice. Open the section Page layout and enable the thumbnail viewing styles that you want to make available on the client facing pages (i.e. grid, list, mini/small, large, flow).
. Note that these are important for several reasons, one of them being SEO. Click on General settings and configure what info (i.e. rights, restrictions and so on) you want to use in the thumbnail templates. which outputs 1 if “rights info” is configured to show on thumbnails. If you decide to use Google icons, then make sure to set this up first. You can then use the example templates that are ready for Google Icons as a starting point. 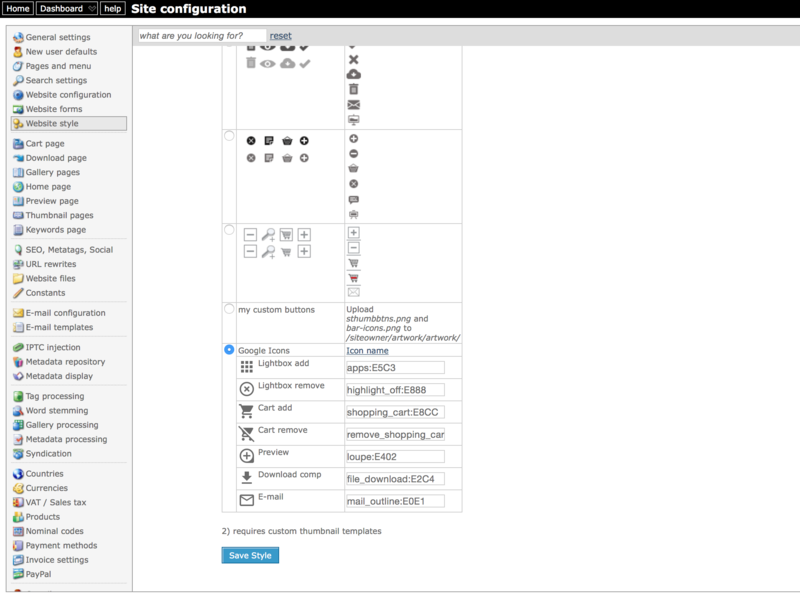 In Site configuration, go to Website style and open the Button images section. If you haven’t changed the settings before, then you’ll see the default Google icon names already filled in. Select the Google icons option and save your settings. You can of course specify different icon names and codes but this is beyond the scope of this article. You can find more information here. Note that the icon names are followed by a colon (:) and a code. The code is used for older browsers, specifically MSIE 9 and lower. This paragraph explains how the grid thumbnail template works and how it can be changed. The other templates are more or less the same, and you should be able to work on those once you have successfully changed the Grid template. Note that the classes and attributes (set with tags) are important because the script “looks for” elements having – or not having – certain class names and or attribute values. In the code editor, select Grid (90) in the dropdown box at the top. Then click “Load example” and load the default code into the editor. // outputs the number of the thumbnail on the page. This is an important element for the XS script, you should not remove it. uses the ‘mediatype’ tag. This will output 0 for images, 1 for video, other numbers for other media types. If your website uses only images, then this line can be removed, otherwise it should be there because it’s used to position video players and icons. Important: starting with version 30, the above div (with class “vicon”) must be moved inside the div with the class “thumbnail”. E.g. // outputs 1 if the file has a blocking restriction, 0 if it doesn't. The next div in the template holds html that either displays when hovering only or always – depending on what you have configured in back office. The above div contains elements for thumbnail buttons, file id’s, restriction info and so on – which is explained below. // outputs e.g. style="width:250px" or style="height:250px"
// outputs e.g. "width:250" or "height:250"
Like all other templates, constants are used to output text depending on the active locale (language). Even if you don’t need support for multiple user interface languages, it is still recommended to use constants because it allows you to manage texts in a central place. Simply change the value for a constant and it will be changed everywhere automatically. To find out more about managing constants, read the article: Website constants. The constants used in the thumbnail templates can have a 3rd parameter, e.g. This 3rd parameter can only be used in thumbnail templates. It tells the parser to replace the constant with data from the repository. It is best to keep these tags as they are in the example code. outputs 'true' if the file is RF or else 'false'. The output values are just examples and can be anything. The templates use e.g. to output class names. outputs the first parameter if there are restrictions or else the 2nd parameter value. outputs the first parameter if there are restrictions for the user's territory or else the 2nd parameter value. If you have configured thumbnail icons to use images (not Google icons) then the buttons HTML will look like lines below. The CSS has background images configured. This example explains how you can display an icon to indicate that a file is RM or RF at all times while having hovering enabled. This is the place holder div element in which the icon will be positioned. The div will be added underneath the thumbnail box later. In this example, it has a top margin of minus 15px to move it up. Note that what the CSS should look like for your particular situation depends of course on how you have configured the thumbnail templates and CSS. The above CSS is just an example. The above tag outputs the relative path to the css folder. You need to go up one folder and then to the images/1_0 folder. Hence the .. in the html. You can of course use your own icons instead. 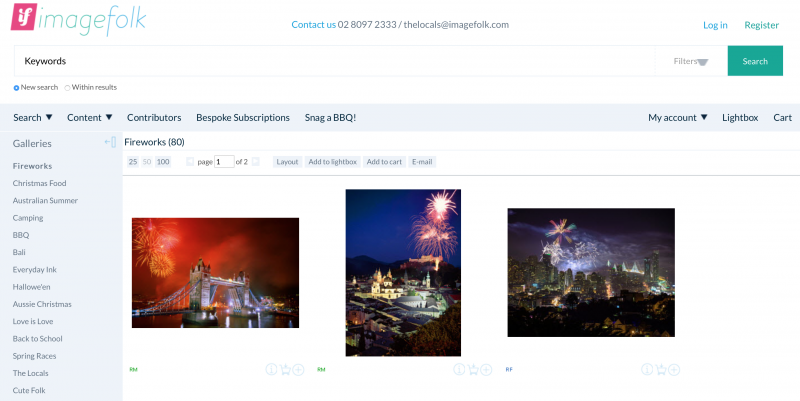 Upload your images via Site configuration, Website files, Website artwork. You will then need to change the path accordingly. 5) Change the other thumbnail templates as required.